From experience. From the market. On request we create your LED continuous line planning! E-Line Next LED makes it all possible. The modular system offers previously unknown flexibility in terms of optics, lumen packages, lengths, protection classes, etc. With maximum quality of light and efficiency of up to 190 lm/W, it's the ideal choice for all continuous line projects. Guarantees extremely high planning accuracy. Thanks to 27 different luminous flux packages between 2,000 and 20,000 lumens. Every order in optimised packaging size: easy on the nerves and the environment. Everything remains. Except more specific. Three module lengths. And one target. To optimally illuminate all rooms. Everything remains. Except more precise. Precise selection of the luminous flux guarantees maximum visual comfort and efficiency. This is the reason why the luminous flux packages of E-Line Next LED can be selected from 2,000 to 10,000 lumens in steps of 500. Between 10,000 and 20,000 lumens, the luminous flux packages can be configured in steps of 1,000 lumens. 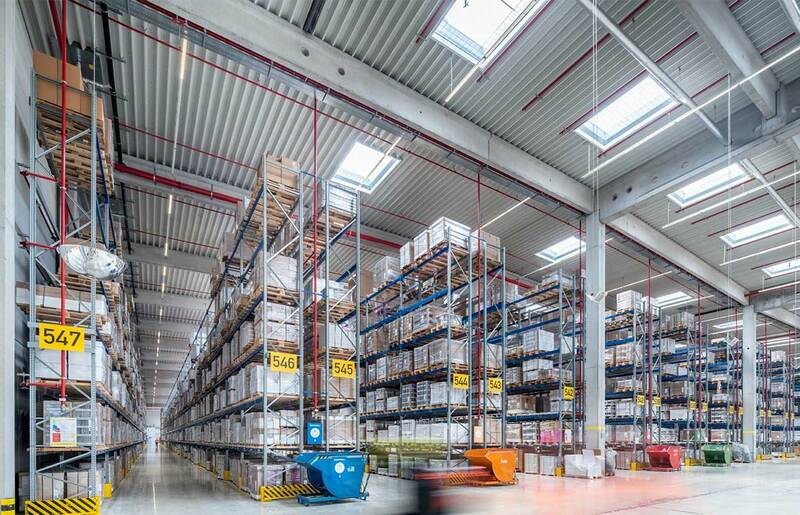 This means that warehouses with high mounting heights can be illuminated just as effortlessly and efficiently as offices, supermarkets and educational facilities. Everything remains. Except more diverse. E-Line Next LED is available with 15 different optics and spotlights. This means it always achieves optimum visual comfort in any application and at any mounting height, and at the same time offers complete flexibility for accenting and emotional light. 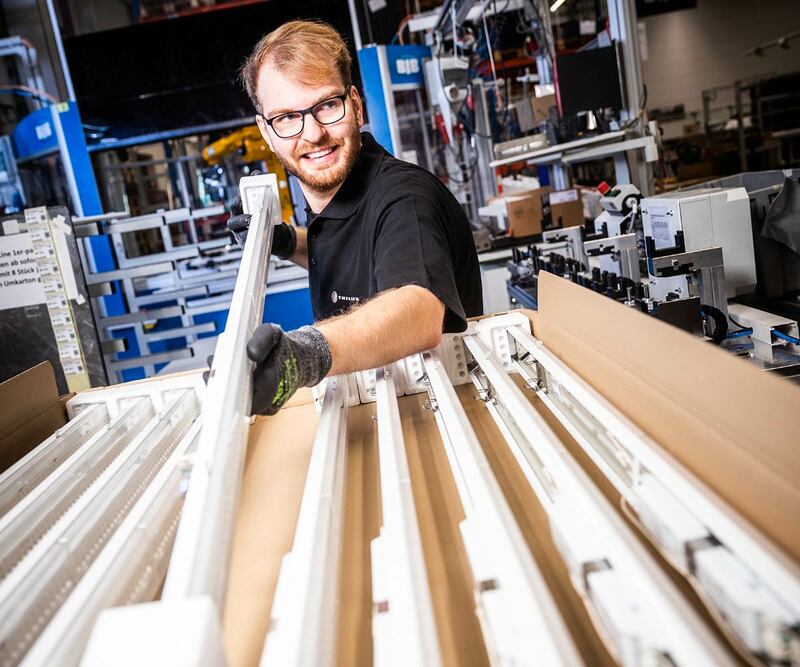 The portfolio includes, for example, glare-controlled solutions for computer workstations, systems with a high colour rendering index, special optics for the logistics sector and double asymmetric optics for ideally illuminated aisles in the retail sector. Everything remains. Except more time-saving. New type of packaging concept minimises frustration, costs and waste. Upon request, E-Line Next LED will no longer be delivered to the construction site in the usual 1 or 4 packs but in a large, tailor-made container optimised in terms of packaging. This not only reduces packaging waste. It also saves time when unpacking and with waste disposal, and reduces installation time by up to 15 percent. Looks more than good: due to the attractive design of the optic and trunking and the high-quality workmanship, E-Line Next LED also looks good in prestigious surroundings. Thanks to the new fastening system, no screw points are visible on the optic. The snap springs can also be easily removed after mounting. This way, not even the smallest detail disturbs the high-quality, minimalist design. With its versatility in terms of optics and lumen packages as well as high glare control, E-Line Next LED provides customised light everywhere. 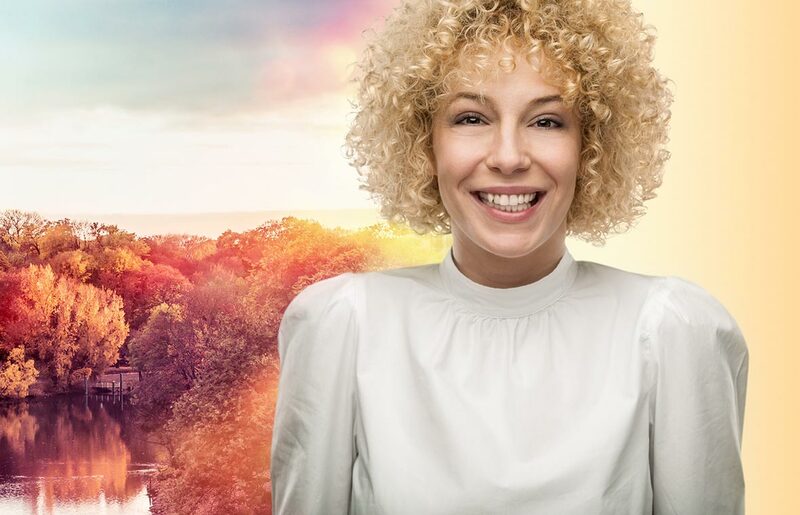 With a colour rendering index of Ra>90 in the standard portfolio, especially natural colour rendering is guaranteed. The result – very good quality of light and maximum visual comfort. A real advantage, especially when details are involved, for example in quality control in the automotive industry or merchandise display in shop & retail. All E-Line Next LED variants are available as HCL-enabled Active solutions. This means that HCL can be used for the first time across applications. 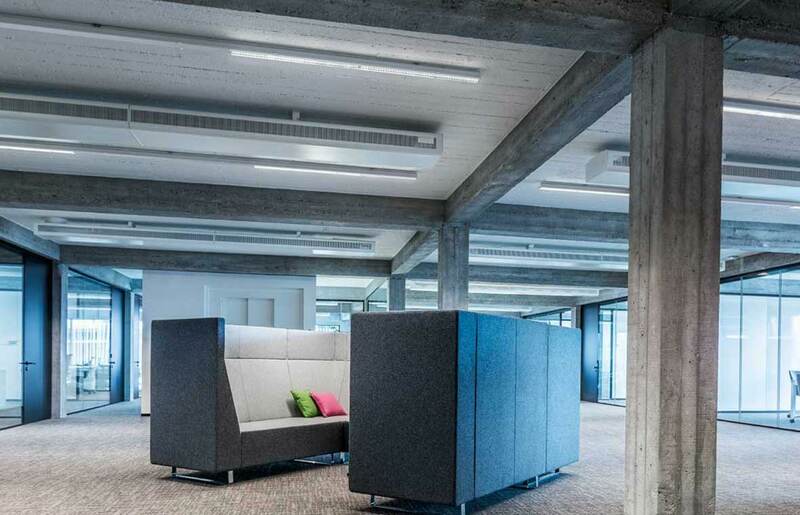 The HCL luminaires change their spectral composition over the course of the day like natural sunlight and thus bring "daylight into the interior of the building". In this way the body receives important impulses that support the biological rhythm and can improve well-being. 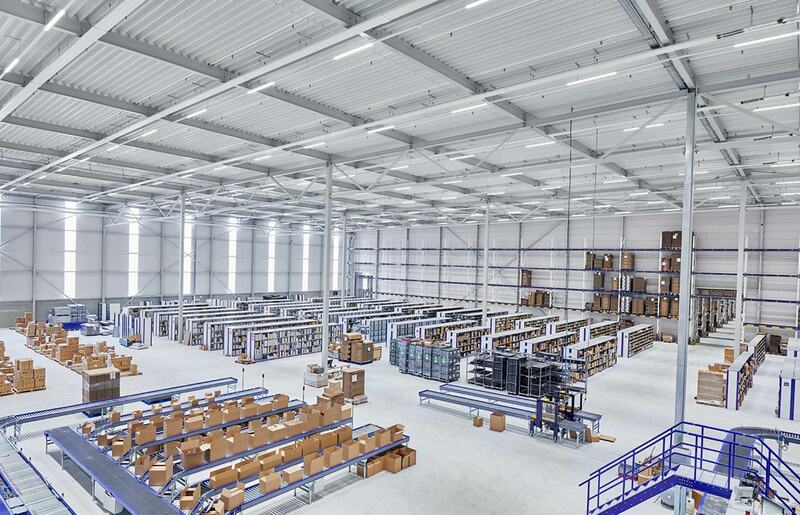 E-Line Next LED offers the optimum solution for every normative requirement and any ceiling height in industrial production halls. Individually settable luminous flux levels also guarantees maximum visual comfort and maximum efficiency. Perfectly illuminated aisles and shelves, an attractive checkout area and a high quality ambience. 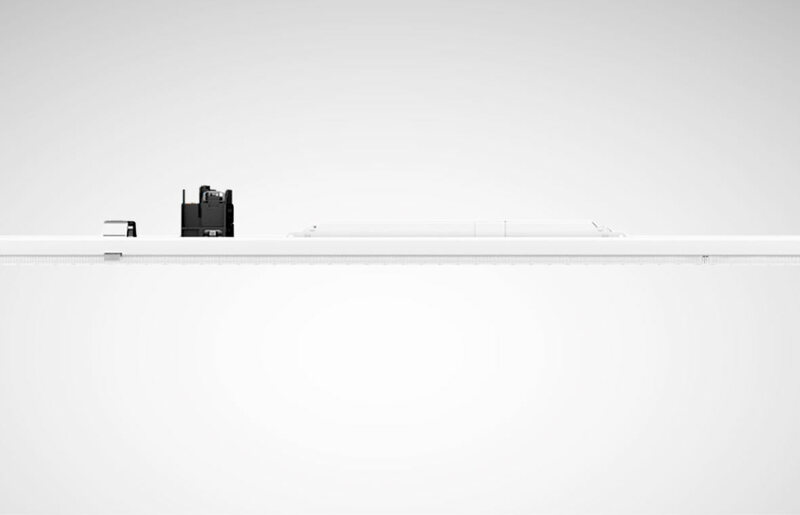 E-Line Next LED is the answer to the trend towards linear lighting systems in modern offices. Whether school desks or blackboards: maximum visual comfort thanks to three special optics and Human Centric Lighting as standard for the classroom. With 15 optics and luminous flux packages from 2,000 to 20,000 lumens, E-Line Next LED can be adapted to any application with unique precision. Sophisticated lighting technologies mean that light points can be saved. Quality of light and energy efficiency (up to 190 lm/W) set new standards. All modules are HCL-capable to e.g. support the well-being of employees, especially during shift work. 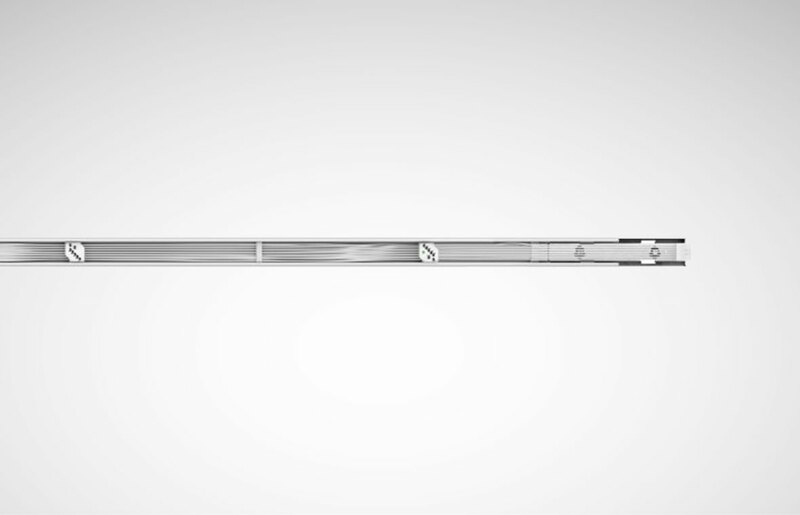 With a colour rendering index of Ra>90 and different application-specific optics and spotlights, E-Line Next LED offers unique flexibility with illumination and accentuation, e.g. with two double asymmetric optics for different aisle widths and heights. 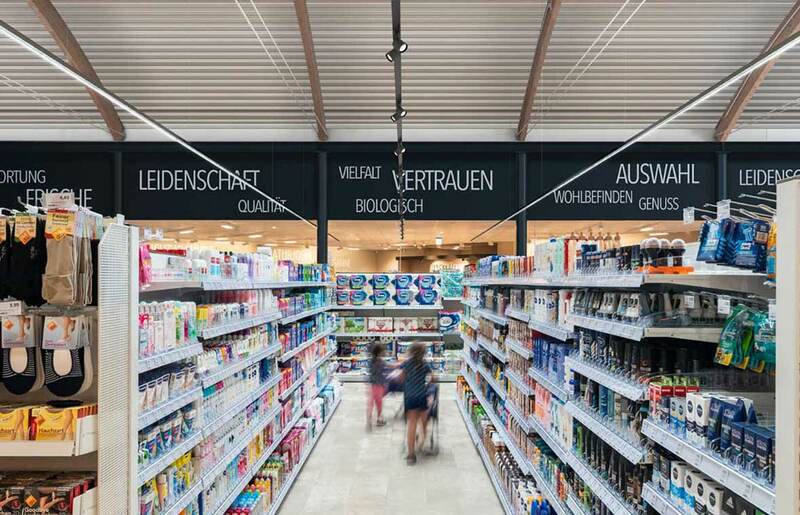 Continuous lines flexibly and efficiently display merchandise in aisles. Increased illuminance at customer eye level is particularly important. In this way, merchandise can be specifically accentuated with light. The use of spotlights additionally emphasises this effect. 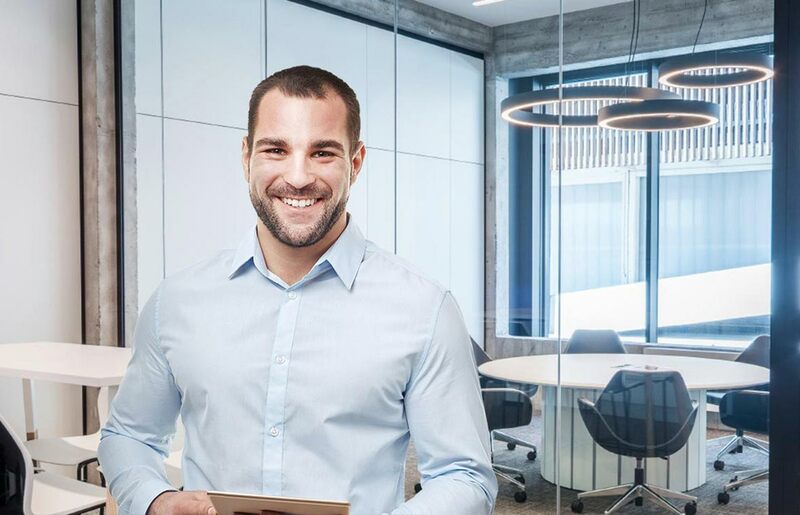 With two different HCL-capable, VDU-compliant optics and spotlights and a colour rendering index of Ra>90, the system ensures maximum visual comfort and employee well-being. Its attractive design, for example, is particularly well suited to office concepts with an industrial look. E-Line Next LED is a real all-rounder with different application-specific optics and spotlights. Whether shelf lighting in libraries, classrooms or for blackboard- or accent lighting. The modular system provides excellent quality of light for maximum visual comfort. In addition, all variants are HCL-compliant. This prevents eye fatigue and improves the ability to concentrate. Changes in the project or a new budget? No problem at all. 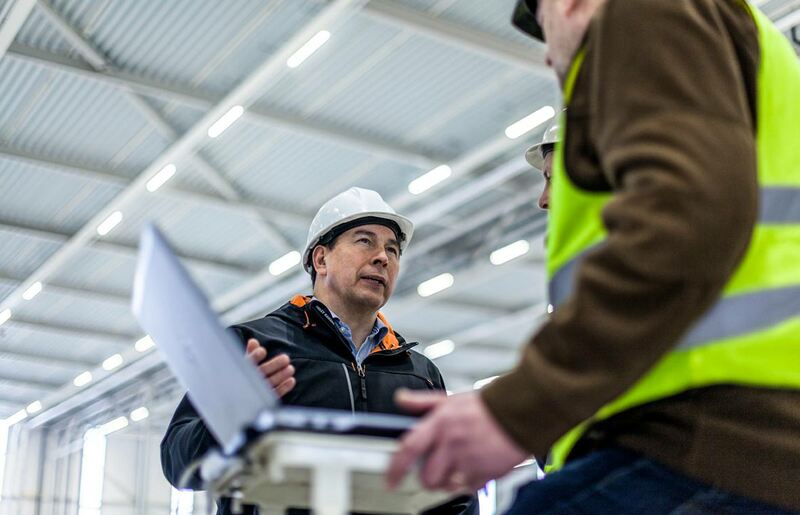 Everything's planned and ready – but suddenly the requirements in a project change, for example due to a new cost framework or the wish to include Human Centric Lighting (HCL). In such cases the lighting designers and architects have to adapt the lighting design. 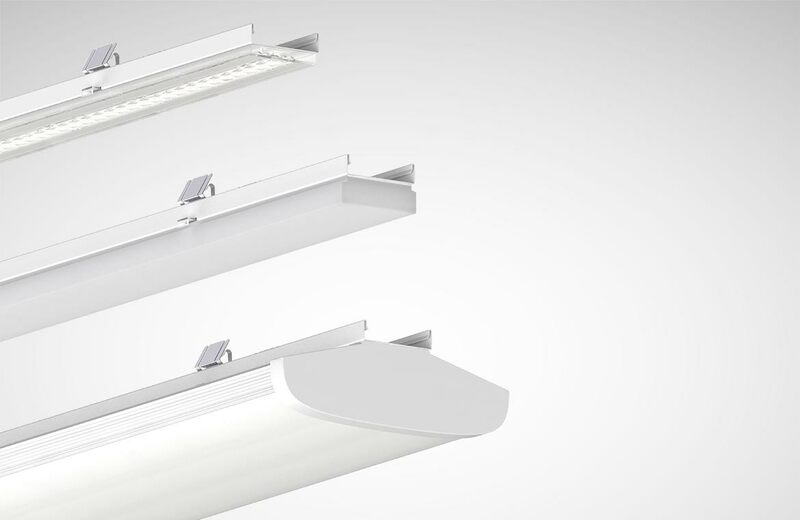 Those specifying E-Line Next LED have a clear advantage though, because all system components are compatible and can be flexibly modified to the new framework conditions. If for example costs have to be saved, it is sufficient to replace the light engine (service life >50,000 h or >70,000 h) without affecting the light distribution. You suddenly want it to be HCL after all? Just replace the gear tray with the corresponding Active variant. Done. In this way, two price points and (almost) all customer needs can be covered with one system. That's flexibility that makes a real difference in practice. With E-Line Next LED, additive technologies and consumers such as emergency lighting circuits or sensors can be integrated into the system. Beacons can also be integrated effortlessly in the future. The Flex version of the E-Line Next LED has an 11-core current conductor, the Fix version has 14 (7+7) cores. The additional consumers make it possible to use the lighting infrastructure for further tasks to increase e.g. comfort and security. Typical for E-Line Next LED is fast, simple and intuitive installation. After the trunking has been attached, the gear trays are simply latched into place without tools via spring catches. A special feature of E-Line Next LED: the spring catch snaps into place after mounting and provides acoustic and visual feedback that it is correctly inserted. 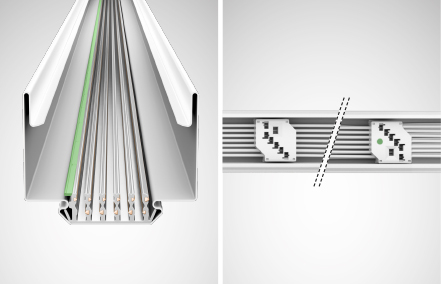 E-Line Next LED Flex has a new trunking geometry and a new type of coupling. This enables suspension distances of 4 metres and saves much time and costs during installation. 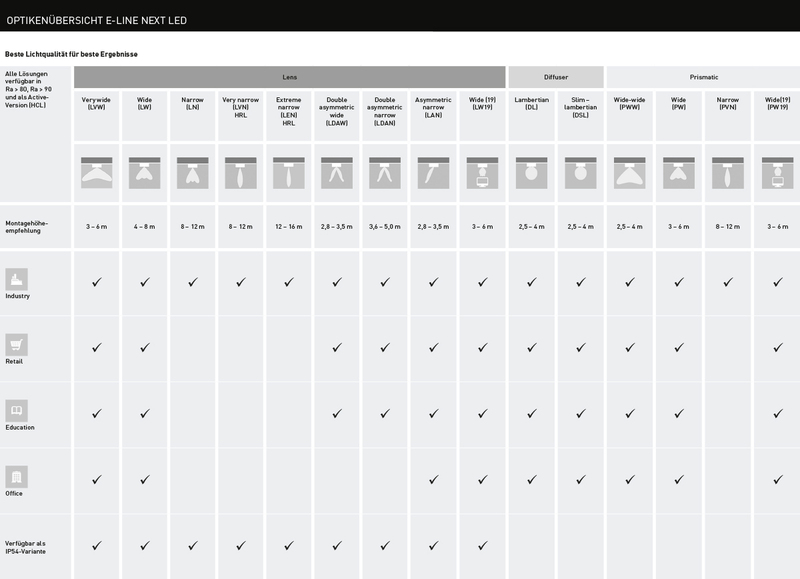 To date, E-Line has been delivered in packs of 1 or 4. However, unpacking and disposing of waste costs time and burdens the environment. For this reason, customers now have the option of having their E-Line Next LED supply delivered to the construction site in tailor-made, large containers instead of in many single packs. That saves up to 15% in time and also protects the environment. The new E-Line Next LED Fix gear trays with their taps also fit old E-Line trunking units, regardless of whether they are LED versions or existing T5/T8 systems.  A renovation is therefore done quickly, easily and with minimal effort. 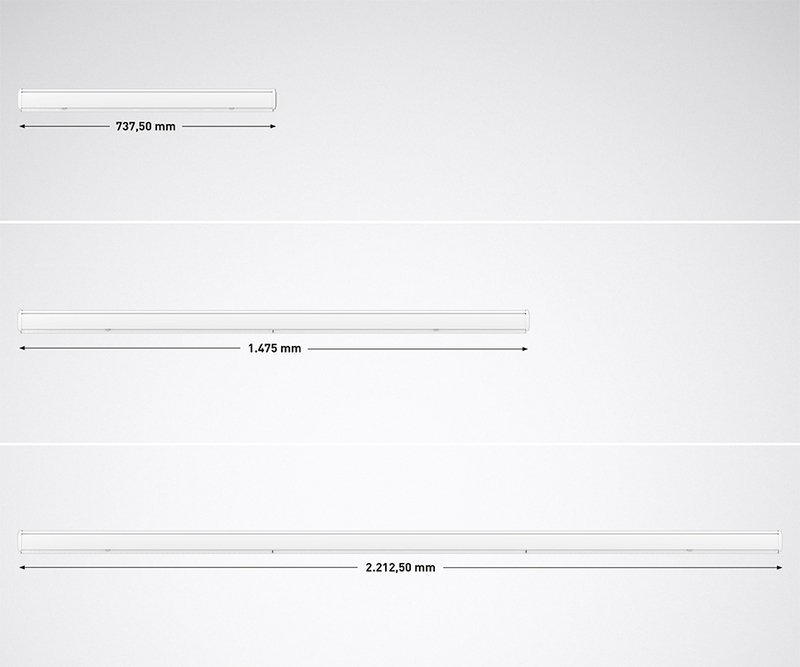 Thanks to its uniquely high energy efficiency of up to 190 lm/W, E-Line Next LED is particularly economical in operation. At the same time, the system scores with a service life of 70,000 h (L80, up to tq 50°C). The result: low operating costs and quick payback periods. Whether it's a T5, T8 or LED system: converting an existing E-Line to the new E-Line Next LED Fix is done in just 44 seconds. Only the gear trays are exchanged. The existing trunking units can still be used. This minimises expensive downtimes when refurbishing during running operation. 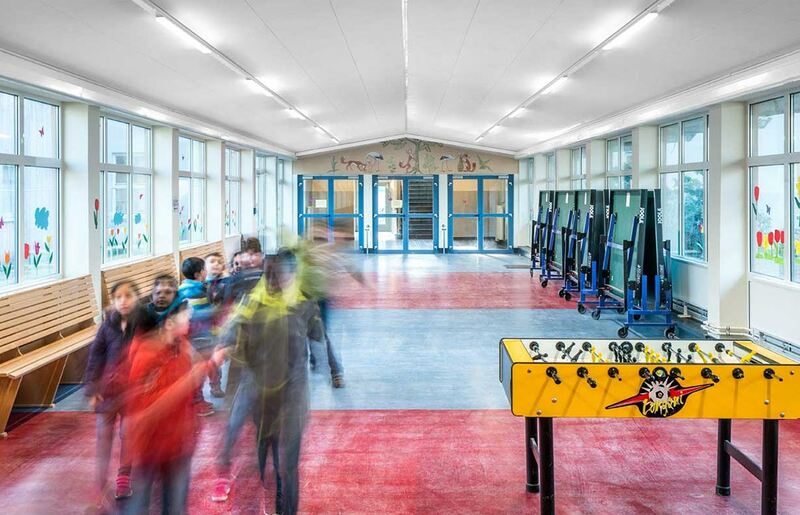 Theft and mischief prevented: the snap springs can be removed after installation so that the luminaire cannot be opened by unauthorised persons after installation (for example in schools and educational establishments). 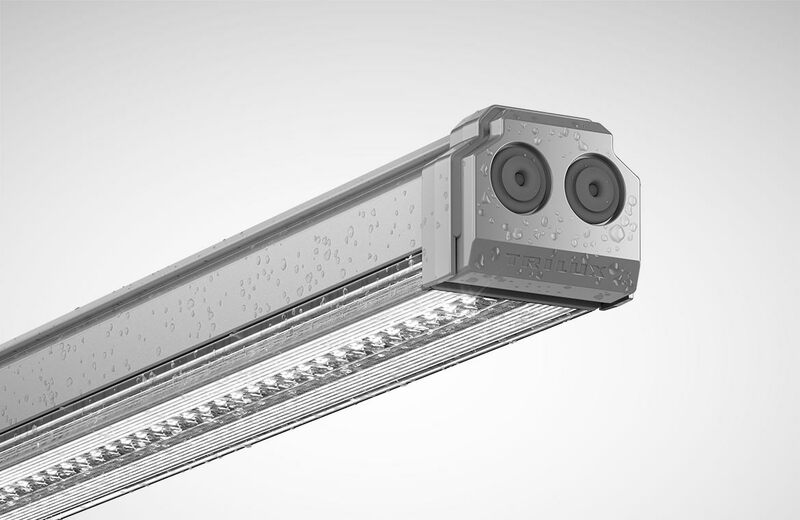 Simply unstoppable: as an IP54 variant the E-Line Next LED shows its robust side, ideal for areas with high safety requirements or harsh conditions, such as cold stores, canopied outdoor areas, industrial production facilities, technical rooms or teaching kitchens in the education sector. High hygiene standards must be maintained in the food industry and canteen kitchens. E-Line Next LED is ideal for this. The special design prevents dust deposits so that all variants – whether IP20 or IP54 – are HACCP-compliant and suitable for use in hygiene-sensitive environments.  E-Line Next LED offers maximum future security. New applications can be implemented with little effort simply by exchanging the modules. The power supply required for this is already available. 11 cores with the Flex version, and 14 cores with the Fix version. As a result, the system can be used to collect and analyse movement data for proximity marketing, asset tracking, etc. or simply equipped with an emergency light module. We are happy to take on all tasks related to your lighting solution, ranging from consulting and integration of various systems to mounting, installation and maintenance. Pay per use is a financing model that enables balance sheet-neutral conversion to LED lighting systems without own investment. In addition to a monthly basic fee, the actual use of the lighting is billed via a variable fee according to use. Disassembly and professional disposal of the obsolete system is also included in the scope of services, as is the installation of the new lighting solution. The system can be monitored with the help of light monitoring; necessary maintenance intervals can be planned accordingly. This means that interruptions in operations and expensive downtimes can be avoided. 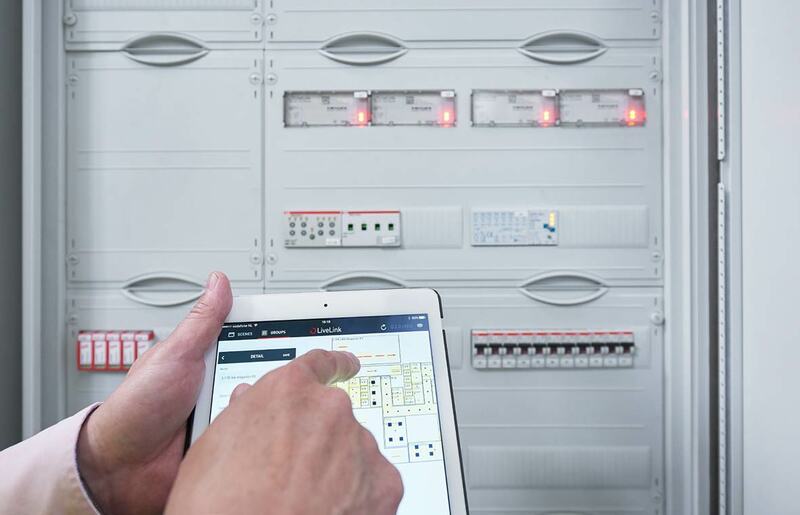 Digitalisation opens up new possibilities for controlling and monitoring the lighting solution. Our monitoring services enable you to keep an eye on your lighting system without effort. 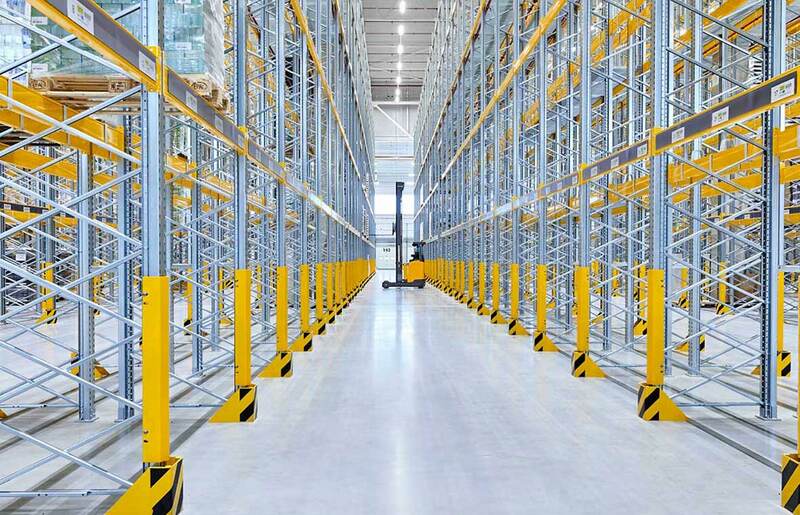 So-called beacons, integrated into TRILUX luminaires, are used to locate people or objects. The individial position of people is then determined via an interaction between the beacon and an app on the user's smartphone. To locate objects, small transmitters are attached to equipment or goods whose position can thus be detected. TRILUX offers the following services: positioning & navigation, asset tracking, proximity marketing and data analysis (e.g. heat maps). Location-based services are services that can locate people or objects. The information obtained helps to navigate or optimise operational processes. 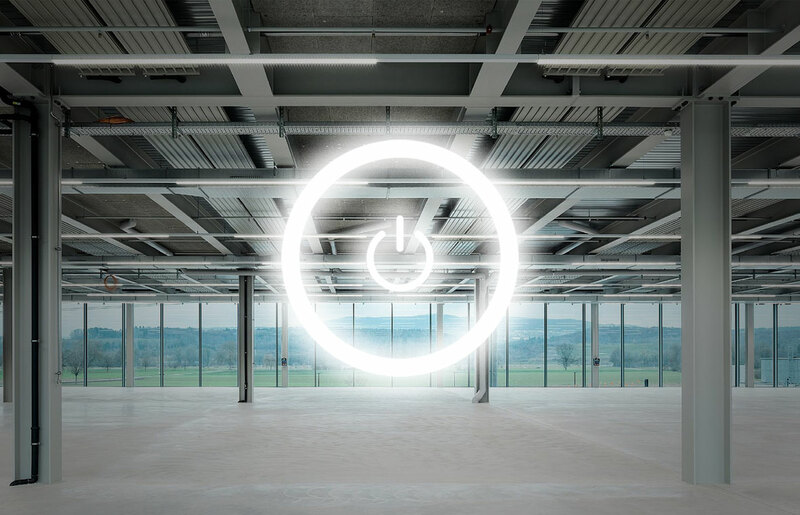 TRILUX luminaires can be simply connected to the LiveLink Cloud via the LiveLink light management system. The monitoring services can be used to monitor the operating data of the luminaires. In addition to various information such as energy consumption and dimming levels, the system also recognises maintenance needs in advance (predictive maintenance): these can thus be adapted to actual requirements. This creates savings possibilities by eliminating rigid maintenance intervals. 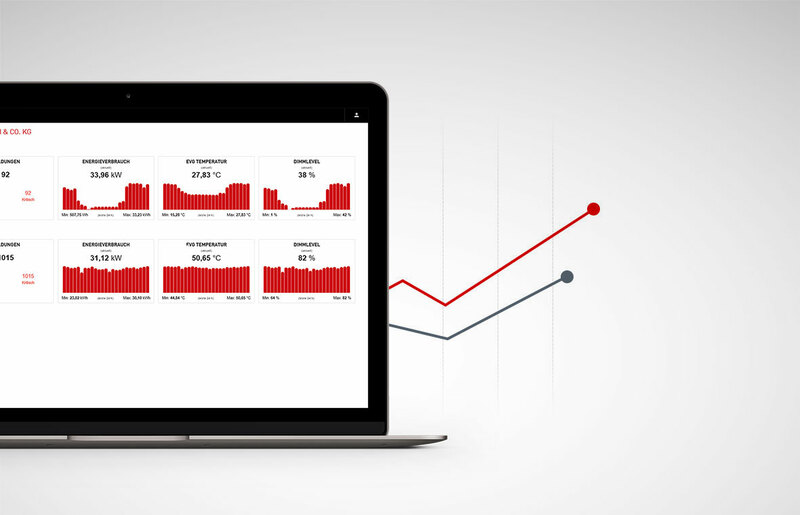 Customers can select between energy monitoring (free) and light monitoring. LED rental, hire purchase or leasing? Or Light As A Service? Together with you, we create the ideal financing solution for your project whilst making sure your balance sheet is not affected. 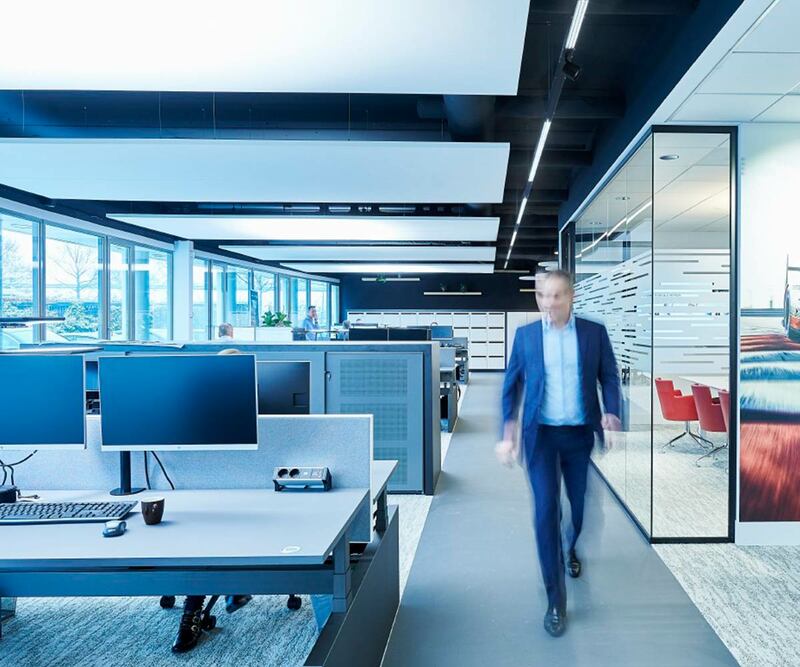 The demands placed on modern buildings are diverse and tailored to the needs of the client: they must be intelligent, sustainable and flexible in use. If desired, we take on the administrative tasks with managing your project and coordinate all systems, ranging from lighting design consultation to the integration of various lighting-related systems such as indoor, outdoor and emergency lighting, light management including sensor technology, logistics, delivery, mounting, installation and maintenance. Convert to modern LED lighting without investment costs and without impacting your balance sheet. The consumption-dependent portion of the monthly rate is based on actual consumption. We take all details concerning "light" off your hands. 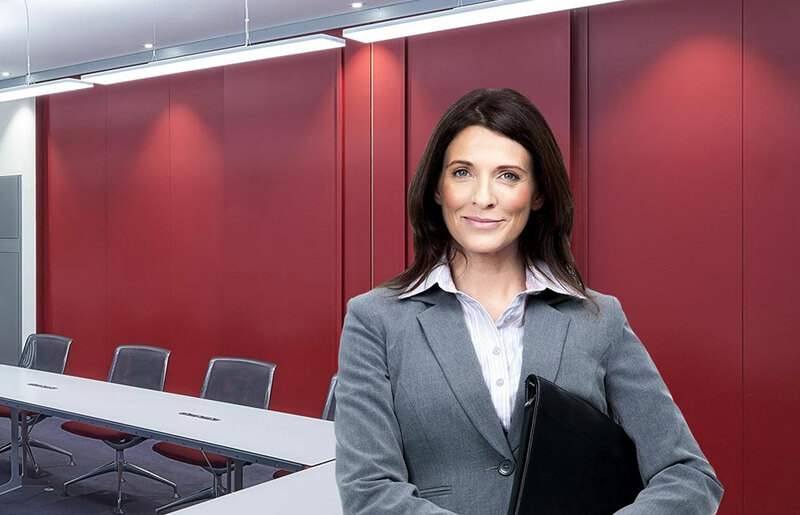 You can concentrate all of your resources on running your business and already save money when installing your new lighting system. Different options adapted to your needs and our comprehensive consulting services ensure that the solution is precisely right for you. In addition to a balance sheet-neutral implementation of lighting projects without own investment, you can also rent only the light needed from a new lighting system on a monthly basis. Do you have any questions about E-Line Next LED? Send your message directly to our E-Line Next LED experts here. *Required fields. Your details will be handled in the strictest of confidence, in accordance with our data protection declaration.